A carpet may well be the most expensive purchase from your trip to Kashmir but it is a lifelong investment. Kashmiri carpets are known the world over for two things. One is that they are handmade and the other is that they are always knotted, never tufted. It is extremely instructive to watch a carpet being made. Stretched tightly on a frame is the warp of a carpet. The weft threads are passed through, the 'taleem' or design and colour specification are then worked out on this. A strand of yarn is looped through the warp and weft, knotted and then cut. The yarn used normally is silk, wool or both. Woolen carpets always have a cotton base (warp & weft), while silk usually has a cotton base. Occasionally, carpets are made on a cotton base, mainly of woolen pile with silk yarn used as highlights on certain motifs. When the dealer specifies the percentage of each yarn used, he also takes into account the yarn used for the base too. So, a carpet with a pure silk pile may be referred as "80 per cent silk carpet" and the warp and weft are not of silk. A third type of yarn staple, also known as mercerized cotton is a man-made fibre. Its shine is not like silk, although in price it is much lower than silk, but more expensive than wool. Staple carpets are made to fill a slot in the market as the customers demand carpets, which are not unlike silk in appearance so as to blend with the decor of their houses. One important difference between silk and staple is that pure silk is far lighter than staple per unit area. Carpet weaving in Kashmir was not originally indigenous but is thought to have come in by way of Persia. Till today, most designs are distinctly Persian with local variations. 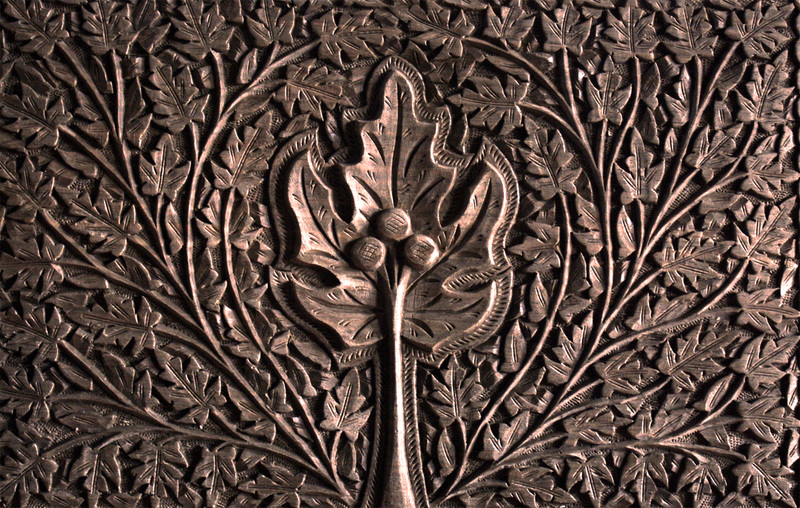 One example, however, of a typical Kashmir carpet is the "tree of life". Any carpet woven in Kashmir is referred to as Kashmiri carpet. The colour-way of a carpet and its details, differentiate it from any other carpet. It should be kept in mind that although the colours of Kashmiri carpets are more subtle and muted than elsewhere in the country, only chemical dyes are used. The knotting of carpet is the most important aspect, determining its durability and value, in addition to its design. Basically, the more knots per square inch, the greater its value and durability. Count the number of knots on the reverse of carpet in any one square inch, and it should be roughly the same as the dealer tells you, give or take 10 knots. If you are told that a carpet contains 360 knots, and your count indicates about 10 less, it simply means that the weft has not been evenly combed down in parts, and several random checks throughout the carpet will even go above the figure of the dealer's estimate. Also, there are single and double-knotted carpets. You can quite easily identify one from the other on the reverse of the carpet. The effect that it has on the pile too is important - a double-knotted carpet has a pile that bends when you brush it one way with your hand, and stands upright when it is brushed in another direction. A single knotted carpet is fluffier and more resistant to the touch, there is no 'right' and 'wrong' side to brush it. Far less expensive are these colourful floor coverings made from woolen and cotton fibre which have been manually pressed into shape. Prices vary with the percentage of wool – a namda containing 80 per cent wool being more expensive than the one containing 20 per cent wool. Chain-stitch embroidery in woolen and cotton thread is done on these rugs. At first glance, all papier-mâché objects look roughly the same, but there is a price difference which depends on the quality of the product. However, besides this there are three different grades of Paper Mache, some are actually cardboard or wood! The idea, however, is not to hoodwink the unwary, but to provide a cheaper product with the look of papier-mâché. To make papier-mâché, first paper is soaked in water till it disintegrates. It is then pounded, mixed with an adhesive solution, shaped over moulds, and allowed to dry and set before Being printed and varnished. Paper that has been pounded to pulp has the smoothest finish in the final product. When the pounding has not been so thorough, the finish is less smooth. The designs painted on objects of papier-mâché are brightly coloured. They vary in artistry and the choice of colours, and it is not difficult to tell a mediocre piece from an excellent one. Gold is used on most objects, either as the only colour, or as a highlight for certain motifs. Besides the finish of the product, it is the quality of gold used which determines the price. Pure gold leaf, which has an unmistakable lustre, is far more expensive than bronze dust or gold poster paint. Varnish, which is applied to the finished product, imparts a high gloss and smoothness, and increases with every coat applied. Contain cashmilon, cotton, or a mixture of both. Pashmina is unmistakable due to its softness. Pashmina yarn is spun from the hair of the ibex found in the highlands of Ladakh, at 14,000 feet above sea level. Although pure Pashmina is expensive, the cost is sometimes brought down by blending it with rabbit fur or wool. It is on Pashmina shawls that Kashmir's most exquisite embroidery is done, sometimes covering the entire surface, earning it the name of 'jamawar’. A second, less frequently seen weaving done only on Pashmina covers the surface with tiny lozenge shaped squares, which is known by the name of 'chashm-e-bulbul,' or "eye of the bulbul". As this weaving is a masterpiece of the weaver's art, it is normally not embroidered upon. Shahtoosh, from which the legendary 'ring shawl' is made, is incredibly light, soft and warm. The price it commands in the market is due to the scarcity of the raw material. High in the plateau of Tibet and the eastern part of Ladakh, graze the Tibetan antelope. During grazing, a few strands of the downy hair from the throat are shed which are painstakingly collected by the nomads, to supply to the Kashmiri shawl makers as shahtoosh. The yarn is spun either from shahtoosh alone, or mixed with Pashmina, bringing down the cost. In the case of pure shahtoosh too, there are many qualities - the yarn can be spun so skillfully as to resemble a strand of silk. Not only are shawls, made from such fine yarn, extremely expensive, but can only be loosely woven and are too flimsy for embroidery to be done on them. Unlike woolen and Pashmina shawls, shahtoosh is seldom dyed. Its natural colour is mousy brown, and it is sparsely embroidered. embroidery. Motifs here are the well-known flower design finely worked in concentric rings of chain stitch. The old city abounds with shops where objects of copper line the walls, the floor and even the ceiling, made generally for the local market. Craftsmen can often be seen engraving objects of household utility like samovars, bowls, plates and trays. Floral, stylized, geometric, leaf and sometimes calligraphic motifs are engraved or embossed on copper and occasionally silver, to cover the entire surface with intricate designs which are then oxidized, so as to stand out better from the background. The work, known as 'naqashi', determines the price of the object, as does the weight. Kashmir is the only part of India where the walnut tree grows. Its colour, grains and inherent sheen are unique and unmistakable, and the carving and fret- work that is done on this wood is of a very superior quality. Items made from walnut wood come from three parts of the tree - the branches, trunk and root. The branches have the palest colour of wood, and the trunk the darkest. The branches have no veins, while the trunks have the strongest marked veins. Objects made out of the root will be the costliest because of the wood used. As walnut is a soft wood, it takes carving very well. Chinar leaves, vine leaves and flowers can be either carved along borders or can fill entire surfaces. The artistry of the carving and its abundance dictates the cost. Trinket boxes and the larger jewellery boxes should have invisible seams. Other walnut wood objects are salad bowls, nut bowls, photo frames, trays and furniture, which range from simple telephone tables to elaborate dining tables with six chairs. In the case of furniture, the price is dictated by the thickness of wood used.